Nexor are now nicely at home in our new offices; a sad part of this is we have to say goodbye to Barney. Prior to moving to a cloud and virtualised infrastructure, we had a large (for an SME) server room with 24 racks. When full of servers, this generated a large amount of heat that needed cooling. 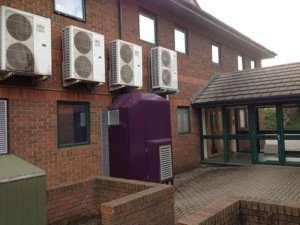 Today’s data centres require huge amounts of cool air to keep the IT kit operating safely and efficiently. This cooling energy consumption typically accounts for up to 50% of the total energy load and significant steps are required to help reduce that cooling load. Nexor wanted to reduce their overall data centre energy bill whilst not compromising on the cooling capability for the IT hardware. 4energy developed and implemented a radical way of cooling the Nexor data centre by utilising fresh outside air and focusing this cool air only on the IT hardware rather than cooling the whole room, as is typically the case in most data centres. 4energy provided regulated cold outside air to the frame inlets and extracted the hot exhaust air away from the data centre. As a result of Barney (and a few other changes) we saved over 50% on our energy bills.